Vancouver Island, near Duncan, B.C. Found on July 20th by farmer Duncan Campbell as he prepared to cut the hay-field belonging to the Land Conservancy Trust on Langtree Road, just opposite his own farm. The single circle measured 18 paces across (approx. 50') and contained a fluffy counter-clockwise lay and a center that was decidedly off what would have been the geometric center. There was no hole in the center. The photo below illustrates our point. A dandelion seed-head which has gone to seed is gently bent over and entwined in the center swirl--with the fluffy seed-head totally intact. Single dandelion seed-head in "full fluff", totally undisturbed in center swirl. As any child who has ever played in a field knows, when dandelions have gone to seed and formed these white fluffy balls the individual feathery seeds can be dislodged by the slighest puff. Dandelions gone to seed were seen throughout this circle, some visible in the photo below. Multiple dandelion seed-heads found in circle on day it was discovered. Another formation, found in a diffrerent section of the same Land Conservancy Trust property, may have occurred around midnight on July 15th when "Helen," a local woman who lives nearby, witnessed a glowing white column of light shooting down from the sky. Thinking her computer had been left on, she got out of bed to turn it off, at which point the tube of light disappeared. around which other plants have been knotted. 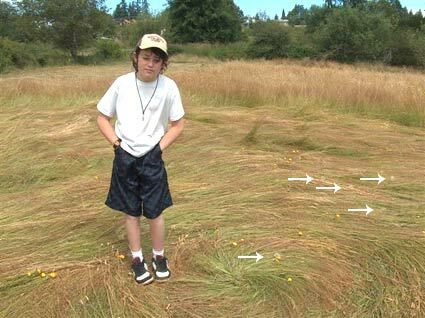 This formation, again in a hay-field, consisted of three exterior flattened circles, each around the rim of a flattened circular ring and at the apex points described by an interior triangle created by flattened pathways. Close-up of tuft with twisted and knotted plants wrapped around it. The lay in this formation looked flatter than that seen in the other B.C. formations this year, but there was no visible damage to the plants when first seen. 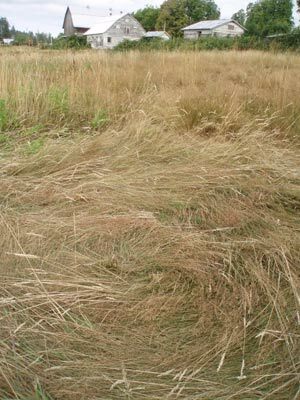 Some layering of the flattened crop was noted, particularly at intersections of pathways. 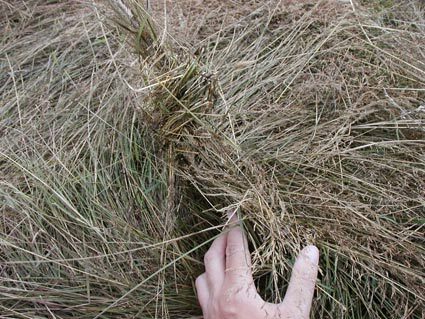 But the most remarkable effect existed in two of the circle centers, where clumps of standing crop were securely wrapped with multiple twisted plant stems. One of these twisted centers has been sampled and will be examined further. Evidence of layering, particullarly at intersections. All three of these Canadian formations so far (mid-August) occurred on southern Vancouver Island, near Duncan—within about 10 miles of each other. 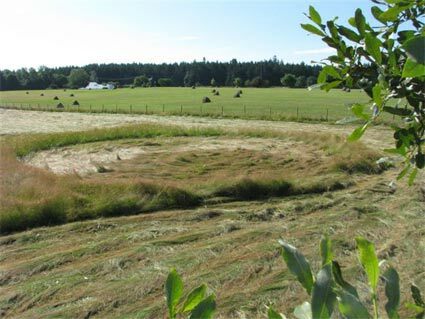 And all three also formed in hay, on Land Conservancy and/or Nature Preserve land, appearing to have been gently flattened in a fluid, flowing manner with no visible damage to the plants. 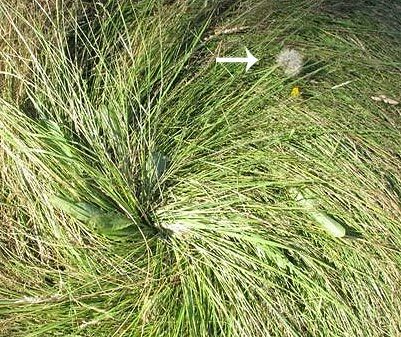 What energetic force is responsible for the dramatic apical plant stem node elongation documented at the Quamichan Lake circle? 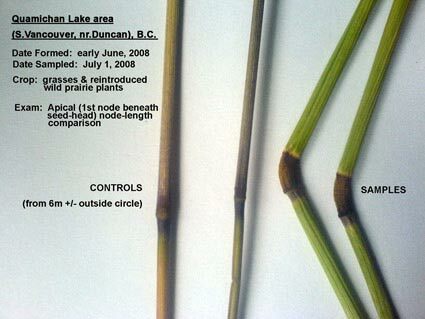 Would we have found the same node changes in the single circle which occurred subsequently, had it not been already harvested? 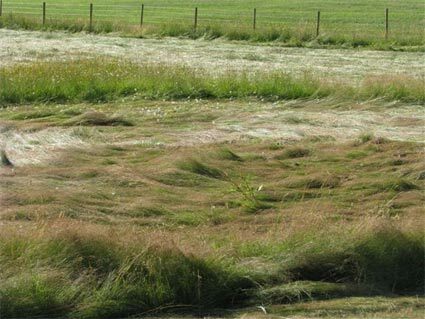 Photo: BLT Research Team Inc.
What energetic force can selectively flatten into recognizable patterns only the previously cultivated plants in a field, leaving re-introduced indigenous prairie plants in that field untouched? 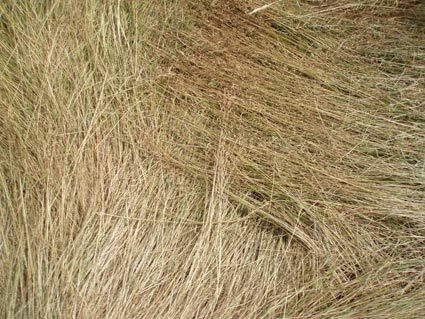 And what sort of energy could possibly flatten fescue around the fluffy head of a dandelion plant which has gone to seed without disrupting it at all—and, further, swirl this fragile seed-head into the center of a flattened crop circle without dislodging any of its seed filaments? And is there a connection between the glowing column of white light witnessed by a local woman shortly before the triangle-in-a-ring formation was first reported? 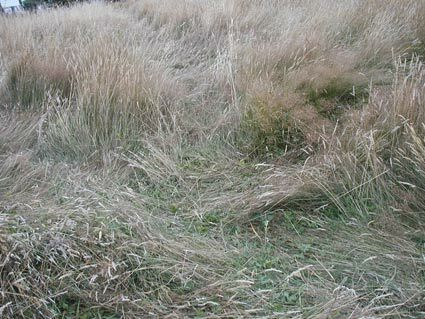 The one in which two of the circle centers contained tufts of fescue wrapped like Christmas presents in fancy ribbon? If these were isolated events they would certainly be of interest. The fact that they are representative of a phenomenon that is on-going around the world--for more than 30 years now—certainly provides adequate reason to consider them seriously.